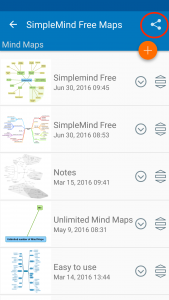 How can I keep working with the mind maps I made in SimpleMind Free? 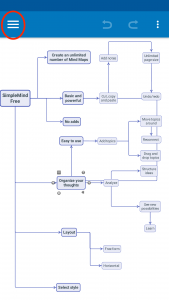 Home » FAQ » How can I keep working with the mind maps I made in SimpleMind Free? The first time you start SimpleMind Pro, it will ask if you want to transfer the mind maps you created with SimpleMind Free. You’ll see a notification when this is complete. Should this not happen automatically, or if you declined, you can do this manually. Install and open SimpleMind Pro. Open SimpleMind Free, tap the menu to open the Mind Map Explorer. Tap the share icon in the toolbar. Tap the import icon. This transfers the mind maps to SimpleMind Pro. 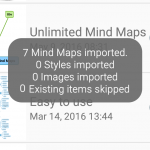 Mind maps that already exist in SimpleMind Pro are skipped. After the mind maps are transferred you see this confirmation. Close SimpleMind Free and start SimpleMind Pro. 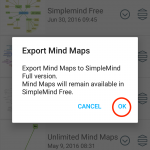 Check if SimpleMind Pro imported all mind maps. If so, it is safe to uninstall SimpleMind Free.